1. Squeeze the Bracelet Blanks closed so that there is no opening. This will prevent the cuffs from getting tangled in the tumbler. 3. Run the tumbler for 3-4 hours to take off any rough edges and bring up the shine. 4. Rinse the bracelet blanks with clean water and dry with a soft cloth. 5. Open each blank so that it is flat. 6. Using the hole punch, punch two holes in the copper blank about 1/16 from the edge. 7. Using a ruler find center on the bracelet blank and make a mark with your sharpie. 8. 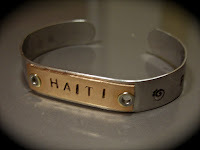 Place the copper blank on top of the bracelet blank centering both pieces. Use masking tape to hold these two pieces in place while you work. 9. Slide the two taped pieces into the hole punch and punch a hole in the same spot that you punched the hole for the copper blank. Do the same thing on the opposite side. 10. Place the grommet in the hole from the front to the back. Place the blank with the back up and the grommet on the metal block. 11. Place the grommet spreading tool in the center of the grommet and tap the spreading tool 3 times lightly with the hammer. 12. Now using the ball peen side of the hammer, tap the grommet area until all the metal is smooth to the touch. 13. Do the same thing on the other side of the copper blank. 14. Remove the masking tape. 15. Now your ready to stamp the metal. Remember to start with the middle letter so that your words will be centered. 17. Once the sharpie is dry, use a polishing pad to remove extra marker that is on the bracelet and bring back the shine. 18. Use a coffee cup or a bracelet mandrel to reform the bracelet to the wrist shape.